The United Families and Friends Campaign (UFFC), a coalition of families and friends of those who have died in the custody of police, prison and psychiatric hospital officials, organised a procession to Downing Street to give a letter to the Prime Minister. 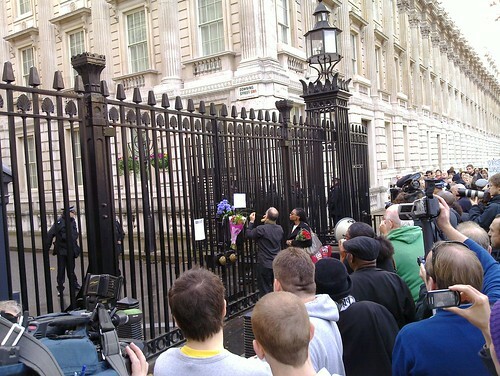 The police refused to let Samantha Rigg-David in Downing Street and they refused to accept it. The letter was taped to the gate; a copy will be sent by post; it is reproduced below. Whether the decision not to accept the letter was entirely a police operational one or a political one, it showed a shameful lack of respect to those families seeking justice and peace. The last conviction of a police officer following a death in custody was in 1971. We write from the United Families and Friends Campaign (UFFC), which is a coalition of families and friends of those that have died by the hands of the police, prison officers and psychiatric nurses in suspicious circumstances. All of us have lost loved ones at the hands of the state and for the past 11 years have been seeking justice by marching to Downing Street to hand deliver a letter to the Prime Minister. This year is our 12th year and we hope this year will make a difference. To date there has been little accountability for the controversial deaths of our loved ones. We have been betrayed by the current inquest system, which is frankly not fit for purpose and feel that our needs and quests for answers have been ignored. Collectively, we insist that you, as the Prime Minister of the new coalition government address these very grave and serious issues personally. The deaths such as those of Christopher Alder, Roger Sylvester, Brian Douglas, Azelle Rodney, Ian Tomlinson, Jean Charles De Menezes, Joy Gardner, Rocky Bennett, Mikey Powell, Jason McPherson, Ricky Bishop, Harry Stanley, Leon Patterson, Sean Rigg, and the very recent death - only 2 months ago - of Olaseni Lewis to name but a few, have overwhelming issues of concern to the individual families and their communities and is a matter of great public interest. The vital need for open, transparent and robust genuine independent investigations and public inquiries into these controversial deaths. The IPCC to date have failed to inspire public confidence, and is not fit for purpose. Unlawful killing verdicts in Inquests are being over-turned with no recourse. Officers should not to be allowed to collude their statements of fact. Cameras need to be in all police vehicles in the interest of both the officers and the public. Immediate interviewing of police and prison officers in cases of this type. All families are being scrupulously means tested and often asked to contribute from their properties and life savings. There is a lack of funds for family legal representation at Inquests, whilst officers get full free non-means tested legal representation from the public purse - surely this is unfair treatment to families who are already struggling and grieving. There continue to be voluminous judicial reviews and legal battles with only 'no case to answer' verdicts. There is a strategy of long drawn out investigations, which go on for years in order to wear families down. Murder, manslaughter, violent and brutal behaviour by state officials is totally unacceptable and we will not give up our pursuance of justice for our basic human right to life. We say that the behaviour of previous governments is shameful. Any moral member of the public with a heart would fail to understand why the government allows such blatant injustices to continually occur, with walls of silence and closed doors in our faces. In light of the new coalition government’s announcement to change this country for the better, we urge you to immediately change the current institutionally flailing system on deaths in custody. Deaths in custody have to stop. If there is no justice, there will be no peace from the families concerned, and we will never give up, shut up, nor go away. We await hearing from you with a positive response. Update: Peter Marshall has published, with his photographs of the event, stories of some of those who have died on his excellent My London Diary. First published on 2010-10-30; last updated on 2010-11-08. We will: [...] introduce a programme to preserve the ability of the security, intelligence and law enforcement agencies to obtain communication data and to intercept communications within the appropriate legal framework. This programme is required to keep up with changing technology and to maintain capabilities that are vital to the work these agencies do to protect the public. Communications data provides evidence in court to secure convictions of those engaged in activities that cause serious harm. It has played a role in every major Security Service counter-terrorism operation and in 95% of all serious organised crime investigations. We will legislate to put in place the necessary regulations and safeguards to ensure that our response to this technology challenge is compatible with the Government’s approach to information storage and civil liberties. This programme, formerly known as the Interception Modernisation Programme (IMP), was estimated to cost £2bn. Chris Williams, over at El Reg, gives some context in Green light for spooks' net snoop plan.